Limit (CYCA) and near-sistership Loki (CYCA) put on a show in Friday’s two races, match racing around the course. Image copyright Rolex/Daniel Forster. After heavy rain that left a millpond, delaying racing by nearly two hours today, the two Divisions contesting Day 2 of the Rolex Trophy Series finally started with breeze just before 1.00pm on the Macquarie Circle off Sydney Heads. Denis Thompson, the Principal Race Officer for the Cruising Yacht Club of Australia series, sent the fleet off on a two-lap windward/leeward course in both Races 3 and 4. Following a general recall, the earlier race was sailed in a heavy 20-25 southerly wind on lumpy and confused seas, the wind monotonously increasing and decreasing in pressure, making it hard for everyone to judge. By Race 4, the wind had swung further to the right into more of a south-easterly. “By the end of the race, winds had dropped to around 14 knots,” Denis Thompson said. The wet day did not dampen the spirits of Limit’s owner, Alan Brierty, who was wearing a Colgate smile back at the CYCA after racing. “I’ll let the boys tell you about our day,” said the West Australian who knew he and the crew had consolidated on yesterday’s lead, even though they did not win a race today, instead scoring second and third places. With a race drop now in place, Brierty’s RP 62 leads Rob Hanna’s newly purchased JV 52 Shogun and Stephen Ainsworth’s RP 63 Loki by two points each, the Victorian owned Shogun second on a countback. LIMIT, leading Division 0 / 1 after race 4. Image copyright Rolex/Daniel Forster. Maguire and the crew know they were lucky to be racing at all, after their shaft drive dropped in the yacht yesterday, the reason still unknown. “We’ve done a temporary repair, but the boat will have to go back to McConaghy’s for a major repair when the series is over. Fortunately, just the shaft drive was damaged, though it is fairly major in itself,” added Maguire. McConaghy’s, on Sydney’s Northern Beaches, will also come to the rescue of Melbourne entry Living Doll, a Farr 55 owned by Michael Hiatt. “We had to pull out of Race 4, we had a problem with a rudder bearing which McConaghy’s will fix for us tonight,” Hiatt said. RÁN’s crew elected not to finish the race, instead preferring to attend to the long work list on the agenda to be race-ready for the Rolex Sydney Hobart start on December 26. Second placed Rob Hanna is pleased with the newly purchased Shogun’s performance and that of his crew, who had not sailed as a team before yesterday. A win in Race 4 gave Hanna confidence in his new boat. “Yesterday was our first race on the boat and this is our first time together as a crew. I have a few of my regulars and I’ve topped up with others like Steve McConaghy (calling tactics) and Sean Kirkjian. Racing has been fabulous,” the Victorian owner said. “The boat went really well yesterday and today. Looking back, I’m glad we had these tough two days, because they put us under the pump and I feel more confident in the boat now,” said Hanna who was disappointed they had blown up a No. 4 headsail in Race 3, which he says, “cost us a win.” Instead, they finished sixth. “The boat’s fantastic and this has been a great learning curve so far,” Hanna enthused. BLACK JACK - Peter Harburg. Image copyright Rolex/Daniel Forster. Stephen Ainsworth’s Loki got a ‘quick fix’ overnight and was back on the race course today in fine form, turning the tables on yesterday’s Race 1 winner, Limit, Alan Brierty’s RP 62, to take out Race 3, Limit this time taking second place. Since their inception, the two CYCA entries have been closely matched at the Australian regattas they have contested. In other news, Geoff Ross retired Yendys (CYCA) from yesterday’s two races, as apparently his new mainsail had not been officially measured. The RP 55 was back on the water today, scoring fourth and second places. There is a new leader in Division 2 this afternoon after Paul Clitheroe’s Beneteau First 45 Balance scored a second place and a win in the two windward/leeward races sailed, knocking yesterday’s leader, Peter Sorensen’s Sydney 36 The Philosopher’s Club, down into third place, while Guy Stening’s Farr 30, Optimum has taken up second place overall . Clitheroe said a torn clew on Balance yesterday had cost them dearly, but he is back where he and the crew want to be – on top in this close series. This afternoon, ‘Money Man’ Clitheroe said: “The ocean state was foul – half the crew fed their breakfast to the dolphins! “When the 30 knot southerly hit, combined with the northerly swell, it was shambolic but somehow comfortable. It’s the hardest racing I’ve had in a long time. Clitheroe also commented: “Denis Thompson set the perfect course with a genuine work up to the first mark, but once we rounded the top mark, it was more about survival than sailing. At one stage we were going so fast, I could have water skied behind the boat! “It’s been great to have two days of heavy sailing for crew training prior to the race to Hobart. Now we’re ready for Bass Strait,” he said. LIMIT - winner of Rolex Trophy Rating Series race 2, division 0 / 1. Image copyright Rolex/Daniel Forster. Two of the major players did not make the start line and two other highly fancied entries did enough damage to warrant pulling out of Race 2 of the Rolex Trophy Rating Series which started Thursday on the Manly Circle just north of Sydney Heads. LIMIT - Alan Brierty. Image copyright Rolex/Daniel Forster. TEAMORIGIN, the British America’s Cup team headed by Sir Keith Mills, today announced their intention of securing a venue in the UK to host a Louis Vuitton Trophy event – as early as August/September 2010 or during the 2011 season – and possibly repeating annually thereafter. The overall objective is to bring America’s Cup type racing to British shores as soon as possible. 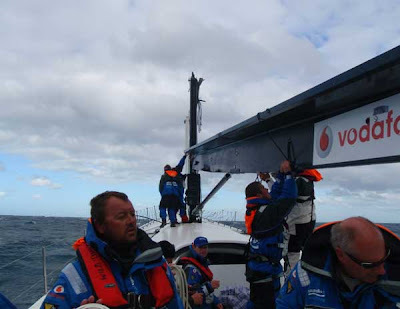 During 2009 TEAMORIGIN competed in two really successful Louis Vuitton Trophy events – the first being the Louis Vuitton Pacific Series that was held in Auckland in February 2009 and, more recently, the first ‘Louis Vuitton Trophy regatta’, in Nice in November 2009. During 2010 the World Sailing Teams Association (WSTA) will organise a further four or five Louis Vuitton Trophy events in venues such as New Zealand, Italy, the Middle East and Hong Kong. TEAMORIGIN’s Principal Sir Keith Mills strongly believes that one of these events should and could be hosted in the UK during either 2010 or 2011. TEAMORIGIN and the WTSA have already compiled a detailed event venue specification document for any venue that might be interested in exploring this opportunity. Clear blue skies greeted the sailors on day five of Sail Melbourne but unfortunately the heavy winds of Thursday afternoon was nowhere to be seen. The Paralympic classes, along with the invited classes, got racing underway at 12pm in light breeze between five and seven knots. Unfortunately the wind disappeared before the afternoon’s racing could begin, with the Laser, 470, 29er and 49er fleets spending the number of hours sitting on the three race courses waiting for the breeze to fill in. When racing finally got underway the light, shifty conditions kept all the crews on their toes with close racing throughout the fleets meaning that a number of classes will go right down to the wire in Saturday’s medal races. Mathew Belcher and Malcolm Page continue to build their lead in the 470 men’s class, with their win today making it seven straight, giving the Australians an eight point margin over Americans Stuart McNay and Graham Biehl. “The Americans came back at us today, we had to keep an eye on them but on the final downwind we had them in check and they didn’t get any more ground on us,” he said. Stacey Omay and Chelsea Hall made it two wins in a row over Jo Aleh and Olivia Powrie, leaving the Kiwis with a four point lead heading into the medal race. Aleh and Powrie were happy to finally get a race in after spending a number of hours drifting around in light wind. World Champion 49er crew Iain Jensen showed no effects from the illness which kept him off the water on Thursday as he and skipper Nathan Outteridge dominated the fleet to take two comprehensive victories. Second placed Peter Burling and Blair Tuke had a tough day on the water, with two fourth positions giving the Australians an eight point margin heading into the final race. In the Finn class James Paterson continues to lead the class, with his two third places today giving him a seven point lead over Warwick Hill with Tim Castles a further four points behind. The Laser Radial women’s class will go right down to the wire with just one point separating Paige Railey and Marit Bouwmeester, after Bouwmeester took the honours in Friday’s only race. Clayton Johnson had a tough day with a 14th position, though he still has the Laser class lead, four points ahead of Canadian Michael Leigh with Matias del Solar third. Peter Russell and Michael Leydon shared the honours in the 2.4m class, winning a race each. Leydon now has a slender one point lead over Canadian Paul Tingley with one race left, with Russel third overall. 2008 Beijing Paralympic Games Gold medallist Tingley had a less than perfect day, picking up two fourth positions. “This is my first time in Melbourne and the race has been good quality and very close. We’ve seen a bit of everything with the weather but it shows that the most versatile sailor will rise to the top and you have to really know what you’re doing to win out there,” said Tingley. “Today picking sides was harder than picking a broken nose,” he said. Duncan and Peter Macgregor continue to lead the Skud 18 fleet, with a win and third place today allowing them to open up a sizeable 12 point gap back to Krista Bailey and Michael Lewenhagen in second with Daniel Fitzgibbon and Tim Lowe one point behind in third. Fitzgibbon and Lowe have raced up the leader board since joining the regatta on Wednesday, winning three of the five races their contested so far. “I’m a bit rusty but definitely enjoying being back out there in the boat,” said Fitzgibbon, who hasn’t sailed a Skud 18 competitively since winning Silver with Rachel Cox at the 2008 Beijing Paralympic Games. “I haven’t trained since the games, taking time to recuperate and get that mongrel back, now I really keen to get back into racing and head towards the next challenge,” he said. “The conditions today we very inconsistent and variable but if you kept your eyes out of the boat and got to the pressure lines you could get a good jump,” said Fitzgibbon. Jessica Crisp continued her good run of form in the RS:X women’s class, winning the day’s race to lead Jannicke Stalstrom by eight points with Angeliki Skarlatou third. Singaporean Leonard Ong continues to be the sailor to beat in the RS:X men’s, four points ahead of James Gourlay with Columbian Nicolas Lozano third. The Laser 4.7 fleet completed one race with Stephen Collings taking the win to consolidate third position. Lloyd Collings continues to lead the class with Ella Evans second. Jack Felsenthal leads the Optimist class by two points over James McLennan with Klaus Lorenz a further 11 points back. In the International Cadet fleet Marcus Sasson leads the way, just one point ahead of Anton and Julian Sasson with William Kelly and Joel Lay third. Michael Williams won the opening OK Dinghy race of the day to hold down his overall lead ahead of Andre Blasse and Tim Davies. On Saturday 2 January, nearly 80 young sailors from 11 countries will take over Takapuna Beach with multi-coloured sailing dinghies and seek to prove on the racecourse that they have what it takes to be the best in the world. The sailors are competing in the week-long Splash World Sailing Championships – a prestigious international event for single handed (solo) dinghy youth sailors. Amongst them will be reigning World Champion Declan Burn, and reigning Girls Champion, Nienke Reina Jorna of the Netherlands. 2008 winner and NZL sailor Ben Lutze is another national favourite to watch, as are 2007 World Optimist Champion, Auckland sailor Chris Steele, and European Opti Champ Etienne Le Pen of New Caledonia, and 2008 World Girls Champ and 2009 Runner-Up, Philipine van Aanholt for The Dutch Antilles. Current World Champ Declan Burns of Picton, who has just completed high school, says he got into the Splash class after his father bought him a boat, about three years ago. “It’s a bit faster than a Starling and a lot of fun,” he says. Competing in New Zealand makes the regatta a lot easier to attend, and while he hasn’t spent a lot of time training in the waters off Takapuna, it is the location of many big sailing events, and that’s an advantage. In 2009 New Zealand won the Nations Cup at the Splash World Champs held in Europe, winning the team the right to host the Champs locally this year. Takapuna Boating Club, led by event director Grant Cunningham, are the event organisers. Participating countries include New Zealand, Netherlands, Belgium, Netherlands Antilles, Germany, France, Peoples Republic of China, The Czech Republic, American Samoa, Samoa and Switzerland. The event will commence with an Opening Ceremony on the evening of Saturday 2 January, followed by registration and measurement, and a practice race over the weekend. Racing proper starts at 11am on Monday 4 January, and conditions permitting, 13 races will be held, finishing on Friday 8 January, and followed by a prizegiving on the Saturday. The best spot for viewing is the beachfront reserve around Takapuna Boating Club on Takapuna Beach, from approximately 11am each morning, or from the water for those lucky enough to have access to a boat. 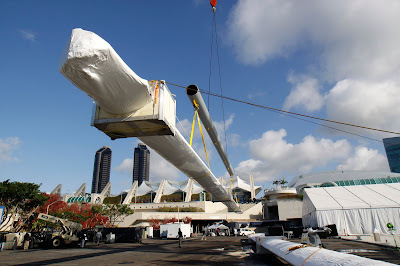 The owner and skipper of the Etihad Stadium Supermaxi got to bed before 3am for the first time in a week last night, with a transport solution for the replacement mast appearing to be settled. But the news is not all good, with the mast not able to arrive in Australia before early Monday afternoon (21 December), leaving the project team and the Supermaxi crew just 3 days til Christmas to put the 98 footer back together again and get to the start line for the 2009 Rolex Sydney Hobart. Timing is critical, and at a time of the year where Christmas cargo is also on a looming deadline, it has been incredibly difficult to find a freight transport timeline that works in their favour, or be able to negotiate with any other cargo to move to later flights to enable them to get on the earliest possible flight to make the best possible connection to Sydney. 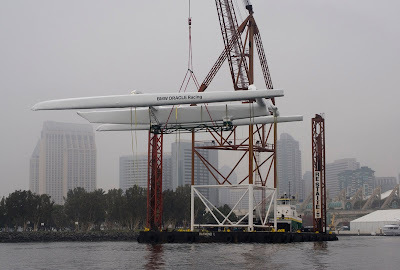 In the case of the precious package of carbon fibre mast that Grant Wharington and his crew so desperately wanted to be in Sydney tomorrow (Saturday 20th December)– there are some horses flying out of Singapore who appear to also desperately need to be in the Harbour City for the weekend as well !! “Unfortunately, we have not been able to bump the horses off the Singapore Airlines flight” said Grant late last night. “We are now confirmed on a Qantas flight arriving in Sydney at two o’clock (AEST) Monday afternoon,” he said, trying to remain positive, but well aware of what this timing does to their chances to be turning south at Sydney Heads on Boxing Day. Ever the fighter, the Victorian skipper is still keeping other options alive. “The only other irons in the fire at this stage are a possible charter flight from Toll Logistics to intercept the shipment in Singapore and deliver to Sydney on Saturday afternoon,” he said. In times of frustration like this, it’s always handy to see a bit of humour lighten up the situation, and Grant’s well known cheeky streak surfaced with an exhausted smile. 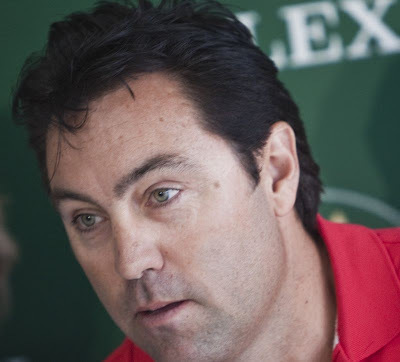 Jokes aside, Grant is feeling thwarted by the effect that the delay in arrival has on the chances for he and his crew to compete in the 65th Rolex Sydney Hobart, a race that at age 45, will be his 24th . “This is very disappointing, as we thought the Singapore Airlines flight was a strong possibility” he admitted – and then explained what the delay means. “Should we have had the package in Sydney on Saturday afternoon, we would pretty much have guaranteed being on the start line,” he said. The 48+ hours that they have lost has severely shortened their odds. “With the mast’s arrival now scheduled for Monday, I’m sad to say that we are now probably only a 50/50 chance at best!” said Wharington. Nevertheless, the project continues in Sydney with many other things on a mammoth list being ticked off. “All the other tasks to modify the boat to suit the new mast seem to be in hand, such as new chainplates, top and bottom boom attachments, as well as hydraulic checkstay and backstay cylinders,” he said. The mast is currently sitting in the snow at Liege airport about to be loaded onto the flight to Singapore – a visual that is the source of significant discontent for Grant. “It is very frustrating to think that upon arrival in Singapore, the mast will be sitting there for over 2 days, not moving while we have 25 men on standby ready to work on it as soon as it arrives in Sydney,” he said. Whilst not admitting defeat by any means, Grant is aware that all the options have been explored and pretty much exhausted. “And the run up to the start of the Great Race is sure to have many more twists and turns, but we really need some major luck soon!” he said. ALL4ONE in action in the Louis Vuitton Trophy off Nice. Image copyright Frank Socha. 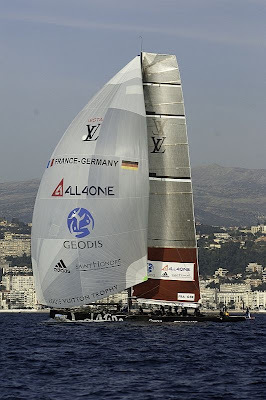 Jochen Schümann, ALL4ONE's Sports Director and Skipper: "Great to have a reliable schedule for Louis Vuitton Trophy events, after the success that was met in Nice Côte d'Azur in November 2009. "ALL4ONE is already planning another overall crew training for February in Valencia on ACC boat, in order to prepare an upcoming busy season as one platform for four challenges with the Louis Vuitton Trophy events, the TP52 MedCup, the RC44 circuit and the World Match Racing Tour. "We will sail in the Louis Vuitton Trophy Auckland with same crews, building on our common experience from Nice. The 5th place in Nice has been a good starting point at our very first regatta as one team. "ALL4ONE wants to improve and is targeting a top 4 place in Auckland. "We are looking forward and we are prepared to face the other top professional teams in tight races in Auckland and La Maddalena. 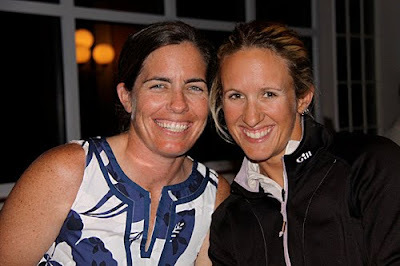 "ALL4ONE appreciates that WSTA takes over the lead role in professional sailing." Stephane Kandler, ALL4ONE's CEO: "the 2010 season's announcement in such prestigious cities is exciting news, while it is very promising in terms of spectacular racing pictures for the public, the medias and the sponsors worldwide. "In less than six months, the World Sailing Teams Association and the Louis Vuitton Trophy, with a first event in Nice, were launched, finally allowing the professional sailing teams to offer an international, yearly and perennial preparation and communications platform. "ALL4ONE's ambition is to become one of the best teams of its kind, while also taking part to the World Match Racing Tour, the TP52 and RC44 circuits. Our team will then be able to rely on an optimal sailing preparation program, but it will also be a permanent and 360 degrees communications platform for our sponsors. "This is why ALL4ONE is so innovative. What we achieved in Nice was a very good start on both aspects, and I know that we have really great champions and collaborators in this team to manage all of that." The World Sailing Teams Association (WSTA) and Louis Vuitton today announced four more Louis Vuitton Trophy regattas for 2010 and early 2011. These new international events follow the successful regatta held in Nice, France, last month. Each Louis Vuitton Trophy regatta is a stand-alone match race regatta sailed in event-supplied 85-foot long AC Class yachts that require a crew of 17 top sailors to sail. The regatta concept is designed to transform a port venue, regardless of its previous sailing culture, into the capital of professional yacht racing for two weeks, along with all the associated activities and excitement, on and off the water. The innovative low cost solution to live TV and tracking coupled with live expert commentary from on board the yachts pioneered at the Louis Vuitton Trophy in Nice last November, allows spectators, hospitality guests and sailing fans around the world to watch live races in a hybrid virtual and real video show. The use of AC Class yachts from the last two America’s Cups now scattered about the world allows the existing boats to be shared regionally without the necessity to constantly ship equipment back and forth; only the crews travel, making for cost effective and easily organised events. The Louis Vuitton Trophy Auckland will bring again some of the best racing teams back to ‘’Kiwiland’’ : Emirates Team New Zealand managing director Grant Dalton said the team welcomed Louis Vuitton’s return to Auckland. The calibre of teams competing is second to none. Most sailors are either world champions, Olympic medalists, round the world sailors or past America’s Cup players. All teams competing at the Nice regatta came with either America’s Cup experience or future ambitions. Emirates Team New Zealand has been both Challenger and Defender in the past, BMW ORACLE Racing (USA) is the current Challenger of Record, whereas other teams such as Azzurra (Italy), TEAMORIGIN (Great Britain), Synergy (Russia), All4One (France/Germany), Team French Spirit (France), Artemis (Sweden) all have future plans. The Louis Vuitton Trophy regattas provide an opportunity to compete at the highest level using similar yachts with only the crew’s sailing ability the deciding factor. The cost to teams is also a fraction of an America’s Cup or an offshore campaign budget, something that has already attracted several new teams to taste the waters at this level of competition. ICHI BAN - Matt Allen, CYCA Commodore. Image copyright Rolex/Daniel Forster. 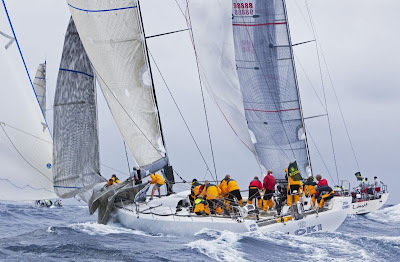 The world's biggest and best assembly of maxi yachts in recent times will contest this year's Rolex Sydney Hobart Yacht Race. Seven of them will be on the start line, and five have a real chance of leading the fleet of 100 entries into Hobart in the 65th running of the Australian 628-nautical mile ocean-racing classic, which starts on Boxing Day, December 26. The competition between these five boats should help to push one of them, given favourable downwind running conditions, to break the race record which stands at 1 day, 18 hours, 40 minutes, 10 seconds, set by Wild Oats XI in 2005. The contest for the race's major trophy, the Tattersalls' Cup for the overall winner on IRC handicap, is wide open and weather-dependent, headed in favouritism by a strong group of TP 52s including last year's winner Quest (Bob Steel), two re-vamped Reichel/Pugh 62-63 foot near-sister designs, Alan Brierty's Limit, with Gavin Brady onboard, and Stephen Ainsworth's Loki, upgraded for their second season. Then there is Ran (Niklas Zennstrom), a Judel/Vrolijk 72 from the UK, untested in the southern hemisphere, but with a formidable track record including winning the 2009 Rolex Fastnet Race overall and Maxi Yacht Rolex Cup in the Mini Maxi division. Onboard will be America's Cup and Volvo Ocean Race veterans, tactician Adrian Stead, Steve Hayles, Tim Powell, Andy Hemmings, and Richard Bouzaid. Michael Hiatt's Living Doll, a one-year old Farr 55, is another hot overall handicap prospect. So is Geoff Ross' Reichel/Pugh 55 Yendys, which has a new keel that is half a metre deeper and 420kg, and will have Volvo racer and 49er Olympian Chris Nicholson as sailing master and principal helmsman. The fleet - the second strongest in a decade - includes 12 overseas yachts. Among them is another maxi the 100ft Rapture, a Farr-designed performance cruiser owned by American Brook Lenfest. The Sparkman & Stephens 41 Pinta-M, (Atse Blei) from the Netherlands remained in Australia since the 2008 race (where she finished third in IRC division 4), and will have another crack at the Tattersalls' Cup. 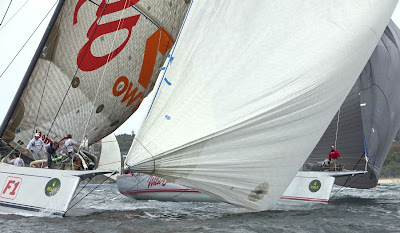 WILD OATS XI and ALFA ROMEO. Image copyright Rolex/Daniel Forster. The head of the fleet duel between Wild Oats XI and Alfa Romeo has been ongoing and close for four years. At their first meeting, Wild Oats XI beat Alfa Romeo by an hour and 16 minutes in her 2005 Rolex Sydney Hobart line honours win. Their duel continued in the Mediterranean in 2006 where Alfa Romeo won the 2006 Maxi Yacht Rolex Cup, with Wild Oats third. In the 2007 Med season, the two yachts swapped line honours dominance at the Giraglia Rolex Cup and Superyacht Cup at Palma. Then Alfa Romeo took line honours from Oats by 38sec in the first race of the 2007 Maxi Yacht Rolex Cup; but, two minutes after the start of race two, Oats' mast fell down, taking the boat out of the regatta. While Wild Oats XI returned to Australia, Alfa Romeo stayed on in the Med for the 2008 season. This year, Sydney-based New Zealander Neville Crichton brought Alfa Romeo back to Australia, on the way taking line honours in the 2,225 nm Transpac Race from Los Angeles to Honolulu, with a time of 5 days, 14hrs, 36mins that broke the race record by more than a day. Neville Crichton, owner and helmsman ALFA ROMEO. Image copyright Rolex/Daniel Forster. Prior to the Transpac, Alfa Romeo put in a new, lighter mast and rigging from Southern Spars, that offers less windage, but otherwise there have been no major changes to the boat. Said Crichton, "There have been little changes that add up to seconds a mile. We tried to pull weight out wherever possible and we have some new sails." Crichton sees Alfa Romeo and Wild Oats XI as the most reliable boats of the five line honours favourites. "In a heavy southerly, Leopard would have the advantage. Heavy air running would suit Etihad Stadium; Wild Oats XI and ourselves are more all-rounders." Despite being lengthened to 100ft, Wild Oats XI will sail with fewer crew, 18 instead of last year's 24 which, notes skipper and helmsman Mark Richards, will represent a weight saving of over one ton in crew baggage and body weight. While numbers are reduced, they still sport an all-star lineup with the likes of Volvo winner and ISAF Rolex World Sailor Mike Sanderson, Robbie Naismith, Ian Murray, Adrienne Cahalan, and Ian Burns onboard. Wild Oats XI and Alfa Romeo were matched equally in speed in the SOLAS Big Boat Challenge; around the 14nm course in Sydney Harbour on Tuesday, the pair were seldom more than two boat lengths apart at each mark rounding in a fair 15-18 knot nor'easter. Alfa Romeo gained the winning lead only when Oats' wine-glassed her spinnaker when hoisting at the last mark. Mark Richards, helmsman and skipper WILD OATS XI. Image copyright Rolex/Daniel Forster. 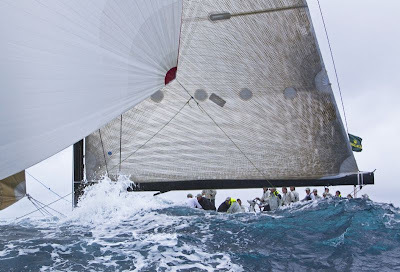 "There is nothing between the two boats in speed," said Wild Oats XI Richards. "In the Hobart it could come down to sail selection and sail changes." At the 2007 Rolex Fastnet Race, ICAP Leopard, a powerful Farr design, built by McConaghy in Sydney, in her first major long-distance race, smashed the record by 8 hrs, 50min, while Alfa Romeo was among the retirements in that edition's rough seas and 40 knot winds. 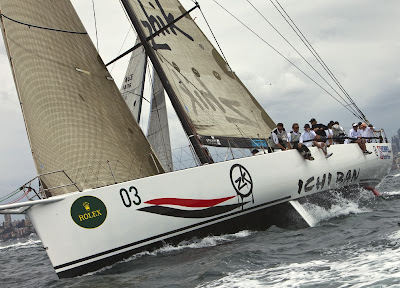 ICAP Leopard finished 27 minutes behind Wild Oats XI in the 2007 Rolex Sydney Hobart after applying pressure all the way, and won line honours again this year in both the Rolex Fastnet and the Rolex Middle Sea Races. In 2007, she was lengthened to 100ft and fitted with twin rudders - and for Hobart the boat has a new sail wardrobe. "Ninety per cent of the sails we will be using in this race are brand-new," says boat captain Chris Sherlock. The crew includes strong afterguard professionals from Volvo Ocean Race and America's Cup teams: navigator Jules Salter, watch captains Brad Jackson and Rob Greenhalgh, and tactician Ray Davies. All were aboard for this year's Rolex Fastnet and Rolex Middle Sea Races. 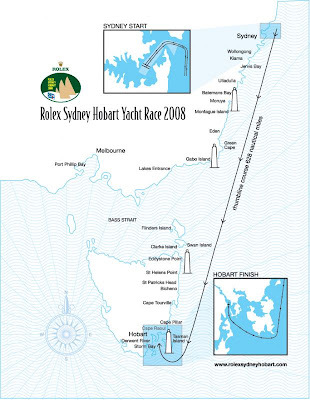 Sydney-Hobart race course. 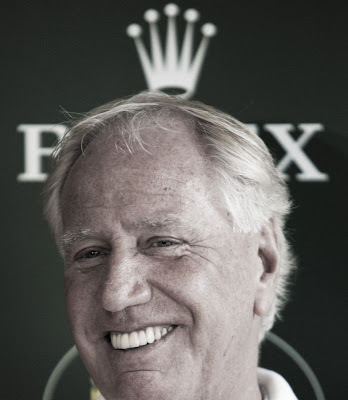 Image copyright Rolex. Molly O'Bryan Vandemoer and Anna Tunnicliffe made the list in 2009 (Anna won the award in 2008). They are pictured at USMRC, St Petersburg YC, Florida, USA. Image copyright Renee Athey. It wouldn’t be December without the annual “year in review” and “best of” lists, and the release of US SAILING’s shortlist of nominees for the 2009 Rolex Yachtsman and Yachtswoman of the Year Awards marks that traditional milestone for the sport of sailing in the United States. It was an outstanding year of achievement on-the-water during the 2009 calendar year: American men won nine world championships, while competitive excellence was achieved by American women in both fleet and match racing events. The nominees will be reviewed by a panel of noted sailing journalists who discuss the merits of each nominee and vote to determine US SAILING's 2009 Rolex Yachtsman and Yachtswoman of the Year. The ultimate winners will be announced in mid-January and honored on February 26, 2010, during a luncheon at the New York Yacht Club in Manhattan, when they will be presented with Rolex timepieces. Established in 1961 by US SAILING and sponsored by Rolex Watch, U.S.A. since 1980, the annual presentation of US SAILING's Rolex Yachtsman and Yachtswoman of the Year awards are considered the sport's ultimate recognition of an individual’s outstanding on-the-water achievements for the calendar year. Over its history the coveted award has been presented to 37 men and 33 women, including these notable sailors who have claimed the honor multiple times: Ed Adams, Betsy Alison, Sally Barkow, Dennis Conner, JJ Isler, Allison Jolly, John Kostecki, Buddy Melges, Ken Read, Lynne Shore, Jody Swanson and Ted Turner. The 2008 winners were Terry Hutchinson and Anna Tunnicliffe. Nominees shortlisted for US SAILING's 2009 Rolex Yachtsman of the Year award: Lightning World Champion Matt Fisher (Columbus, Ohio); CST Composites International Moth World Champion Bora Gulari (Detroit, Mich.); Sheehy Lexus of Annapolis Melges 24 World Champion Chris Larson (Annapolis, Md. ); Sunfish World Champion David Loring (Charleston, S.C.); SAP 505 World Champion Mike Martin (Newport Beach, Calif.); Finn Gold Cup Silver Medalist Zach Railey (Clearwater, Fla.); Rolex Farr 40 World Champion Jim Richardson (Boston, Mass./Newport, R.I.); 2.4 mR World Champion John Ruf (Pewaukee, Wisc. ); DN Iceboat World Champion Matt Struble (San Diego, Calif./Bay City, Mich.); and Star World Champion George Szabo (San Diego, Calif.). Nominees shortlisted for US SAILING’s 2009 Rolex Yachtswoman of the Year award: ICSA/Laser Performance Women’s Singlehanded National Champion Anne Haeger (Lake Forest, Ill.); Kieler Woche Laser Radial Champion Paige Railey (Clearwater, Fla.); U.S. Women's Match Racing Champion Genny Tulloch (San Francisco, Calif.); Rolex International Women’s Keelboat Champion Molly O’Bryan Vandemoer (San Diego, Calif.); and Semaine Olympique Française Laser Radial Champion Anna Tunnicliffe (Plantation, Fla.). Shifting winds dominated the afternoon racing on day three (16th December) of Sail Melbourne, with the conditions keeping sailors on their toes and forcing them to work hard for every position gained. Singapore’s Seng Leong Koh is in control in the Laser Radial men’s class, ten points clear of Elliott Noye with Christopher Jones one point further back. 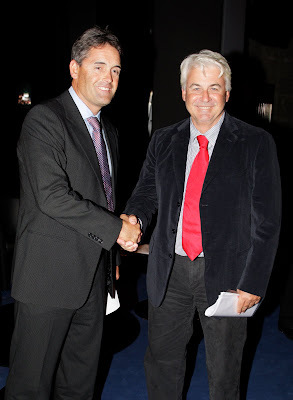 Russell Coutts (left) and Brad Butterworth (right) shake hands at the WYRF in Monaco. Image copyright OnEdition. Following over two years of legal disputes regarding the format of the next America’s Cup in the New York Supreme Court, Russell Coutts (CEO, BMW ORACLE Racing) and Brad Butterworth (President, Alinghi), spoke together publically for the first time during last week’s World Yacht Racing Forum in Monaco. Both Coutts and Butterworth gave individual presentations on their respective Challenge and Defence before joining several potential challengers to discuss the future, shape and options for the 34th America's Cup. Presenting first, Coutts told the audience that if the U.S. were to win the Cup, it would propose establishing professional and neutral management for future AC events. “The first step to a healthier future has to be truly independent management of the sporting issues. I believe this as does Larry Ellison, who has made a public pledge to have professional and independent management if BMW ORACLE is successful. The next America's Cup must be guided by the principles of neutrality, fairness and mutual consent between the Defender and challengers”, he said. Talking about the extraordinary performances of the multihulls built for this special edition of the Cup, the Alinghi President outlined his team’s vision of the future saying that he would love to have a multi-national, multi-challenge 34th America’s Cup. “If we are fortunate enough to win the 33rd match we would like to discuss the type of boat with the challengers.” Butterworth added he did favour multihulls over monohulls, which later triggered an interesting debate between potential challengers. Both Coutts and Butterworth described their enthusiasm for the giant multi-hulls they are testing, Coutts calling his boat “a triumph of imagination, design and engineering.” He also paid tribute to Alinghi's catamaran. “I think in another 100 years, people might look back and see the BOR 90 and Alinghi 5 in the same way we now look at Reliance and Shamrock - as two of the most extreme Cup yachts of all time and landmarks in the Cup's rich history,” he said. Nicolo Bastianini (GreenCom), Paul Cayard, Magnus Holmberg (Victory Challenge), Stephane Kandler (All4One), Sotiris Buseas (Greek Challenge) and Marcus Hutchinson (Team Origin) then joined Coutts and Butterworth on stage for a debate about the future of the event after AC 33. A point often repeated was that the class of boat should be something the majority of the challenging teams support. Talking on behalf of their respective teams, all panellists expressed clear – yet solvable - differences regarding the format, dates and type of boat to use for the next edition of the regatta. On the other hand all panellists agreed that an independent management was necessary, Brad Butterworth reminding his colleagues that its establishment would be difficult due to the complexity of the event. Led by Paul Cayard, the speakers then unanimously endorsed the idea to rapidly create an official group of challengers and to start working concretely, together, on a Protocol for the next America’s Cup. “We have a unique opportunity right now”, Cayard wrote after the Forum. “Neither Alinghi and BMW Oracle knows who will be holding the cards for the 34th America's Cup. So this is a time where each may be more willing to agree to a "fair and independent" event management structure. Either could find themselves on the Challenger side for 34th America's Cup and that party would certainly want a modern and objective event organization." Some amendments have been made to the selection policy for the 2010 NZL Yachting Trust Youth Team to attend the 2010 ISAF Youth Worlds in Turkey. These amendments have been approved by the Board of Yachting New Zealand, and although they mainly effect the Open Multihull Class, it is recommended that all youth sailors read and be familiar with the current policy. The selection policy can be found on the YNZ website under the sailors tab -2010 NZL Yachting Trust Youth Team For any further queries, please contact Ian Neely at Yachting New Zealand. 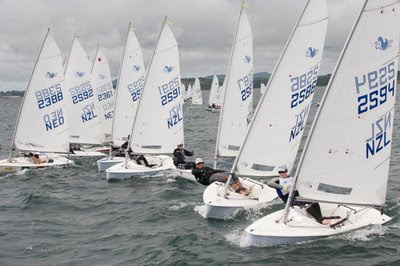 Youth sailors training hard in the lead up to youth selection regattas will be keen to read a new section on Yachting New Zealand’s website about conditioning for youth sailors. The section includes new online training guidelines, targets leading up to youth selection regattas, and a programme that you may wish to use. In response to an international review of safety standards in boat design and construction conducted by ISAF, Yachting New Zealand has published a new appendix to the Safety Regulations of Sailing 2009-2012, Appendix 7. Appendix 7 will affect all racing boats built or modified after 1 January 2010. All yachts intending to compete in international events, or in the Fiji or New Caledonia races, will need to comply with Appendix 7 – however a boat of an older design that has proven safe over time, will be eligible to race if no substantial modifications have been made. There are also a number of minor amendments to the existing Safety Regulation Book 2009-2012, most notably the reduction in inspection periods for boats racing under Category 2 and 3, from three years to two. “Back when I was a lad, mentoring was a big part of learning to sail and learning how to be a coach. I first experienced this when the old boys from the frostbite class would see me sailing round in circles in my Starling. They would give me pointers on the beach after a race. They could see me struggling and were happy to offer advice. These guys became my mentors and I would always ask them for advice or to check my thinking and decision making. Later on I was asked to be involved in some club coaching. This really helped my sailing, I was able to learn the best way to communicate with different sailors and found many ways of demonstrating and explaining skills needed to sail around a course. 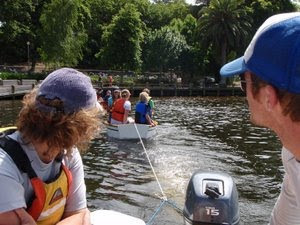 At my club everyone did a little coaching, we would sit in a chase boat with a more experienced instructor or coach and we would learn their drills and games, we would see how they interacted with their sailors and you could compare this to how you did it (for better or worse). It is this that I want to highlight and bring to your attention. Its an important part of sailing better and developing better coaches. I have spoken to all of the YNZ Performance and Olympic coaches and they are committed to helping keen coaches to develop. That means that if you are a coach and keen to get better at your practise there is an opportunity for you to do this for free! This can be done at one of the YNZ Zone Development Clinics coming to a town near you soon or any time a YNZ coach is in your area. It’s up you to pick up the phone and make it happen, so if you are keen to make something happen, call or email me and I will place you with a coach. The other option is to go to your club and talk to the old boys ask them questions, jump in a chase boat with other coaches and start developing a list of games and drills to use, think about how you coach and how others do it! Think how could it be done better. 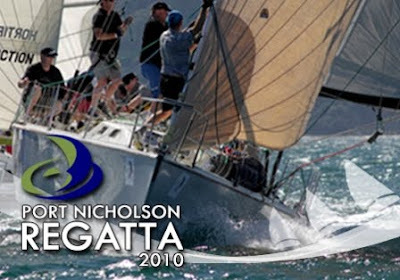 The Royal Port Nicholson Yacht Club will host the 10th annual Port Nicholson Regatta from 11-14 February 2010. This year the club is welcoming IRC keelboats, open keelboats, Ross 780s and sports boats from around the Country to the Club’s annual regatta. The regatta follows hard on the heels of the OK Dinghy Nationals, Inter-Dominions and Worlds being hosted by the Club over the preceding two weeks. Regatta Director Pedro Morgan is expecting the Regatta’s largest fleet ever. “The Round North Island race, IRC and Ross 780 Nationals and the return of sports boats to the regatta have us expecting a fleet in excess of 50 boats.” The regatta will see a number of Auckland, Christchurch, Picton and Nelson yachts competing in the IRC and open keelboat divisions. Jim Farmer’s new IRC 52 Georgia (Auckland) and Peter Gray’s Young 99 Nonstop (Nelson) will be lining up against top Wellington boats including Andrew Taylor’s Davidson 55 Andiamo, Mike Calkoen’s Young 11 Flying Boat (defending IRC champion) and Tony and Vesna Wells’ Young 11 Clear Vision (defending PHRF and open champion). The Club also has four Farr MRXs available for charter. The MRXs rate extremely well on IRC and offer a real winning chance for crews who are unable to bring their own yachts from out-of-town. “This regatta is the only real opportunity for keelboats from around New Zealand to compete against each other on handicap” says Morgan. Keelboats are also invited to take part in the Club’s ‘Settler’s Cup’ race, on 30 January. This race, from Ship Cove to Wellington is timed to catch the Club’s offshore fleet returning from Nelson, and should draw the Club’s largest offshore fleet of the year after the Cook Strait Classic. This race is a great way for Keelboats from Waikawa and Nelson to make the journey to Wellington. 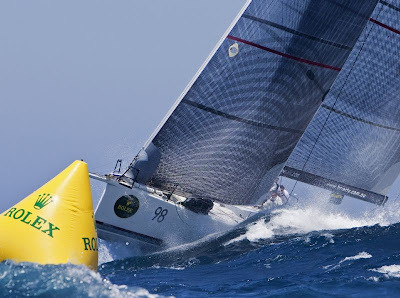 The Ross 780 fleet joins the regatta for the first time, while the sport boats return after several years away. The club has recently had a Shaw 650 join its fleet sparking renews interest in sport boats. RPNYC expects a strong Shaw 650 fleet, with boats expected from Auckland and Christchurch. In addition to its reputation for great racing, the regatta also has a reputation for putting on a great party. According to the Club’s Rear Commodore, Mandy Scott-Mackie “Last year’s sumo wrestling will be tough to beat, although we have one or two ideas. It wouldn’t be a Port Nicholson Regatta without a party or two”. 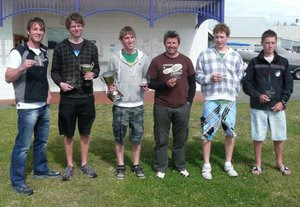 The December Laser South Island Champs regatta run by Timaru Yacht & Powerboat Club attracted nearly 50 Laser and Radial yachts and an 8-10 knot NE Wind saw 18-year old Alex Morris take out the championship, on a boat borrowed from his father. Organisers congratulated Alex on his great improvement over the season, following a 15th placing in 2008. Peter Graham placed second overall, and Bruce Adams third. Glen Robertson was the first master, and Morris Hall the eldest competitor. The BMW Auckland Regatta is one of the premier sailing events on the New Zealand keelboat racing calendar. Jointly run by the Royal New Zealand Yacht Squadron and Bucklands Beach Yacht Club, entries are invited from all keelboat clubs throughout New Zealand. Racing in 2010 will take place in the Northern Leading Light in order to be closer for boats coming from Tamaki River and Auckland Marinas. Divisions remain open until entries have closed, and for 2010, a new division has already been established for the classic yachts, which will race on their own courses. Divisional winners from the BMW Auckland Regatta will be eligible to advance to the BMW Sailing Cup. This will see competitors sailing off in identical Farr MRX yachts for the honour of representing New Zealand in the BMW Sailing Cup World Final to be held in Auckland in March. The Big One – Round North Island! The third BSport Telecom Round North Island Fully Crewed Race will start at 11am on Saturday 6 February from Westhaven in Auckland Harbour. Following successful races in 2004 and 2007, the race is held the year prior to the SSANZ (Short Handed Sailing Association of New Zealand) two-handed Round North Island Race, giving skippers a fantastic opportunity to sail around the North Island of New Zealand with a full crew before possibly taking on the challenge two-handed the following year. Organisers select a clockwise or counter clockwise course based on the weather forecast, with Leg 1 always starting in Auckland and finishing in Wellington. Despite the marathon distance, racing is close. 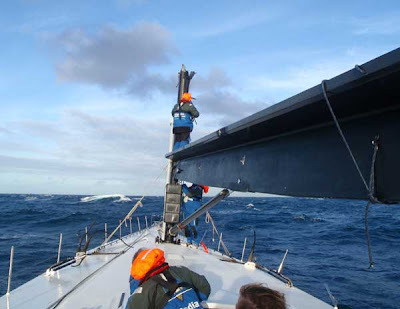 In 2007, the first boat arrived in Wellington just 89 hours after the start, and the first four boats finished within seven mintues, after around 600nm of sailing. The fleet is hosted by the Royal Port Nicholson Yacht Club and competitors are invited to take part in the 2010 Royal Port Nicholson Regatta during the weekend of 12-14 February. 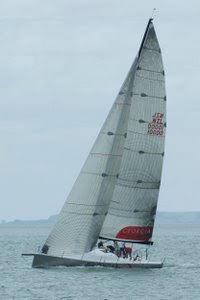 Leg 2 back to Auckland will start at 2.00 pm on Monday 15 February from the RPNYC in Wellington Harbour. The first boat would be expected back in Auckland on the afternoon of Thursday 18th February 2010. The Pt Chevalier Sailing Club will be running a junior sailing programme for children aged 9 yrs and above in Term 1, 2010. The Club has had a great Junior Programme in term 4 and is happy to expand this a little bit further next year. You’ll learn how to sail an Optimist dinghy – or if you already know we will put you in a group with others of similar ability, including sailors and racers to all levels. Each session will have a briefing before and after and we will work on all the things you need to know to be able to control an Optimist confidently. We’ll be doing a combination of adventure sailing and round the buoys. If the weather is bad we’ll be learning how to tie knots, and we’ll go over things like tides, wind, and boat setup or fun stuff like ocean swimming back to shore with all our gear on. The idea is to have fun and gain confidence – leading to racing for those who are confident and keen. Jim Farmer’s new Georgia IRC 52. Supplied image. Keelers of all shapes and sizes, sports boats, multihulls, flying fifteens, and the passage divisions for cruising boats, will congregate at Bay of Islands Sailing Week in January 2010. Simon Hull’s new super speed sailing machine, the Open 60 Team G3 is ready to rocket across the Bay; Jim Farmer’s new Georgia IRC 52 has done the HSBC Premier Coastal Classic and now is a ‘known quantity’ is racing for victory. And the Aussie 63 foot Reichel Puch Limit , wants and needs to make a conquest - so watch out New Zealand. This is an exciting week for competitors and volunteers. Fun, laughter, screaming, cheering, eating, drinking. Bay of Islands Sailing Week just gets better and better. Not to forget the Beach Party on Roberton Island at end of racing on Race Day #2. Skippers can enter on-line at the terrific race website, which also is a great place to find crew or to advertise yourself if you are looking for a crew spot. The New Zealand contingent competing at Sail Sydney secured nine top ten placings in final results, despite frustrations with light and shifty conditions. 230 entrants participated in the regatta, including a large international contingent to amass points towards their Olympic campaigns for London 2012. International entries came from Great Britain, Ireland, the USA, Chile, Spain, Singapore, Greece, Canada, Japan, Finland, Hungary, Switzerland, Norway, India, Korea, Norway, Croatia, Poland and Italy. 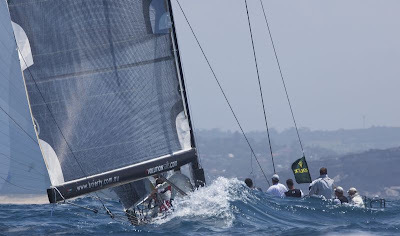 The Sail Sydney Regatta, the only ISAF Grade 1 event in NSW, is the second event of the Sail Down Under series. The third and final event is Sail Melbourne, the first round of the ISAF Sailing World Cup. It looks like summer is finally here and with it the regatta season in this part of the world. Congratulations to all those that are performing so well in Australia right now. The successes over there show the depth of talent we have and the strength of working and training together as squads to push each other and share knowledge. The New Year will bring the focus for our domestic season with Sail Auckland and Class Nationals. Good sailing to all there. Looking ahead, in the next twelve months we are focused on assisting people break into the top 10 consistently and secure podium places at agreed pinnacle events. Key steps in 2010 include building a working relationship with your coaches and contributing to the wider NZL sailing team. Make sure that you look at the Olympic page for some new information and dates for next year, and all the best for the coming regattas. Yachting New Zealand has made a significant and full submission to the New Zealand Government. The submission is part of our advocacy against plans for the unimpeded and accelerated growth of aquaculture in all of the places 1.5 million New Zealanders want to go boating. Our freedom of navigation in the coastal marine area, and access to sheltered bays for both enjoyment and safety can no longer be taken for granted. In the next 15 years, marine farming intends to increase its turnover by almost 300%. This ambitious goal will have the most significant affect in Northland, Coromandel, Marlborough, Banks Peninsula and Stewart Island. The visual and environmental affects will negatively affect water-based tourism and New Zealand’s 100% Pure image, and sailors will no longer take for granted the freedoms enjoyed for generations. The present protection afforded to the Hauraki Gulf by the ARC may not be continued in the regulatory changes being proposed. “Plans currently being finalised by the Government ignore the coastal marine area as a public space and the traditional freedoms of New Zealanders to enjoy the adventure and enterprise it has always offered. They also ignore the importance of marine tourism which is very much a part of New Zealand’s attractiveness to overseas visitors. Yachting campaigns have for many years significantly contributed to or were part of campaigns to promote destination New Zealand. The boating industry also depends upon people being attracted to the sea and buying boats,” states the Submission. • Marine farms should be located in low-interest areas of our coastline - areas which have little recreational or tourism value YNZ’s preferred solution is to prudently simplify the current approach while encouraging the Aquaculture industry to focus its efforts on branding and growing high value species in low-interest areas of the coastal marine area. • If major changes are to be made, then it is YNZ’s clear preference to engage in a consultative and mediated approach rather than through litigation. In our experience greater certainty is desired by most parties. • It should be possible with consultation and mediation to accommodate planned growth in aquaculture without compromising safety, recreational interests, environmental values, and the sustainable commercial activities of the marine and tourism industries. Nearly 80 entrants from 11 countries are participating in the Splash World Sailing Championships. The Splash dinghy is an exciting single handed boat designed for teenage sailors and is an important precursor to Olympic sailing. It is a class that New Zealand has excelled in, winning the Nations Cup at the 2009 Splash World Championships. Timed to coincide with international school holidays, racing starts on Saturday 2 January, and finishes on Friday 8 January, and will be held out of Takapuna Boating Club in Auckland. New Zealand contenders include reigning World Champion Declan Burn of Picton, 2008 World Champion Ben Lutze of Taipa, and 2007 Optimist World Champion, Chris Steele of Auckland. Auckland Mayor John Banks announced Tuesday the Auckland Festival of Sail – three major international regattas to be held on the Waitemata Harbour in March 2010. The events will bring together leading professional international match racing skippers and teams and top-ranked amateurs for 23 days of quick-fire, top-level competition. The Omega Auckland Match Race Regatta, from March 1-6, will feature some of the biggest names in international match racing. Entry is by invitation. The Louis Vuitton Trophy Auckland regatta, March 7 – 21, follows on from the successful Louis Vuitton Pacific Series sailed in Auckland last February. The action will take place over 14 days. The BMW World Sailing Cup 2010 final, March 22 – 25. A leading international keel boat event for amateur sailors. New Zealand won the right to host the event by winning the 2009 world cup. Mr Banks says the festival is a perfect opportunity to showcase Auckland and its spectacular waterfront. “Not only is this great news for Aucklanders with another festival added to the summer events calendar, it’s also great news for businesses, especially those in the hospitality, tourism and marine sectors. “Major events are important economic drivers especially during the tough times that we are currently experiencing. Securing this festival in Auckland is another step on our road to establishing the city as a desirable international events destination and we look forward to welcoming the world’s best sailors to our shores next year.”The managing director of Emirates Team New Zealand Grant Dalton said the three regattas, combined with the Auckland International Boat Show at the Viaduct Harbour from March 10 -14, will provide three weeks of top-level action right in the city. “When the idea of the Auckland Festival of Sail was first raised, many groups came together to really put on a show for Auckland and New Zealand. “We have worked closely with Auckland City agencies, the Royal New Zealand Yacht Squadron, Louis Vuitton, the World Sailing Teams Association and many other organisations and individuals to make it happen. “In a few days we will be able to announce the names of the skippers who have accepted the invitation to take part in the Omega Auckland Match Race regatta. Scott Colebrook, commodore of the Royal New Zealand Yacht Squadron, says the Squadron is proud to be undertaking an integral role in the Auckland Festival of Sail. “As the organizing authority of these three significant events, running back to back, we will be placing huge demands on our volunteer race and boat management personnel and resources. Venue: Viaduct Harbour with race courses in the inner Waitemata Harbour. New Zealand won the right to host the regatta by winning the 2009 world final. The New Zealand crew will meet the winners of the national competitions held in Germany, Italy, Malta, Portugal, Spain and Hong Kong. Race management: Bucklands Beach Yacht Club and Royal New Zealand Yacht Squadron. The BMW ORACLE Racing team has departed San Diego for Valencia, Spain, in preparation for February's 33rd America's Cup Match. 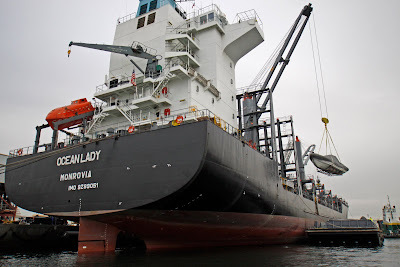 The cargo ship Ocean Lady left the Port of San Diego early on Tuesday afternoon and turned south. It will pass through the Panama Canal before heading across the Atlantic Ocean and into the Mediterranean Sea. The trip to Valencia will take approximately three weeks, depending on weather. 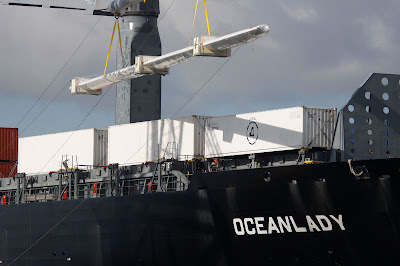 The cargo on board is unique, with the ship carrying approximately 200 tinnes of material, including: the BOR 90 trimaran, the main element of the wing sail, four custom made boxes containing the wing flaps, two spare masts, 19 shipping containers, and 10 other boats (RIBs etc). "It's certainly been a challenge to get through all of this," said Scott Sandford (NZL), who managed the process for the team, along with Julien Di Biase (SUI). 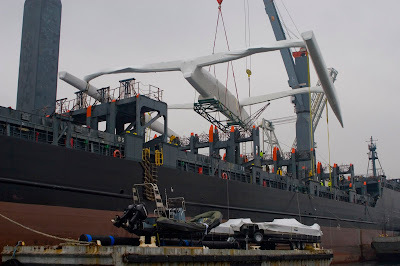 All of the material was taken to the ship from the team base by water, and loaded on board with the ship's crane. "Everything was staged on two barges - the chase boats and pushers, and the shipping containers. We pushed the barges over to the ship and they were unloaded by the ship's crane. 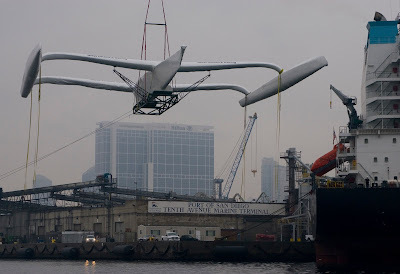 The trimaran was lifted up with a big floating crane and it rode 'under the hook', suspended in the air, over to the ship. It was the same for the masts and the main wing element," Sandford explained. Weather proved to be an additional challenge, with wind hapering the first attempt at moving the wing. 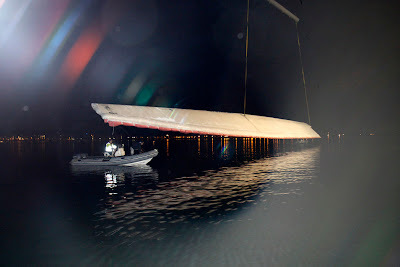 But overnight Monday night, the wing was transported across in calm conditions and loaded safely onto the Ocean Lady. With the San Diego base now closed down and packed up, the team will reassemble in Valencia following a short Christmas break and immediately resume preparations for the Match. On Tuesday, the Appellate Division of the New York Supreme Court affirmed an earlier decision confirming Valencia as the venue. The first race of the 33rd America's Cup Match is cheduled for February 8, 2010. The Appellate Division of the New York Supreme Court today upheld Justice Kornreich's decision of 30 October 2009 that disqualified the America's Cup Defender Société Nautique de Genève's choice of Ras Al Khaimah in the United Arab Emirates as venue for the 33rd America's Cup. 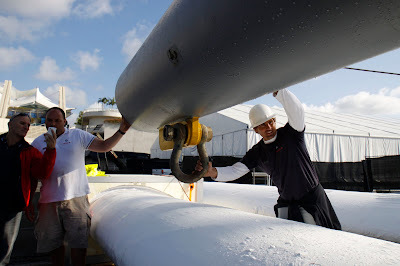 The four-judge panel also upheld Kornreich's decision to exclude rudders from the measurement of the load waterline length of the race yacht. 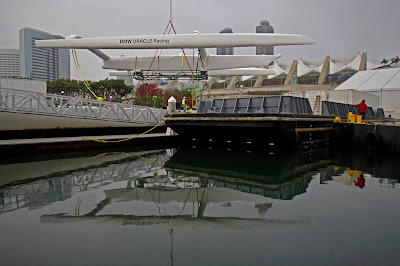 “Once again BMW Oracle's strategy to try to win the America's Cup in court instead of on the water has been successful. For the first time in the history of the America's Cup the Defender has been stripped of its fundamental right to select the venue. Société Nautique de Genève accepts this decision and Alinghi is looking forward to racing for the America's Cup on the water in Valencia, Spain, in February 2010,” said Fred Meyer, SNG vice-commodore. 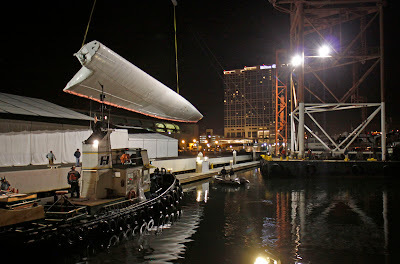 The focus for the 33rd America's Cup is now squarely on Valencia, Spain. The Appelate Division rejected the defender's second attempt to have Ras Al Khaimah, UAE, host the February match. "This is a big stride forward," commented Tom Ehman, Golden Gate Yacht Club spokesperson. "In place of doubt and delay, the sailing world wants certainty. It wants to see this contest go ahead soon and be contested under fair rules." The New York Supreme Court ruled on October 30th that Ras Al Khaimah did not comply with teh Deed of Gift, a decision upheld by the Appellate Division in a unanimous verdict. The Court also turned down SNG's second attempt to have rudders included in the crucial Load Water-Line measurement calculation. This has never occurred in the 32 previous America's Cup matches and won't happen in the 33rd. "With the International Sailing Federation re-drafting the previously unbalanced and unfair agreement it struck with the Societe Nautique de Geneve, and discussions continuing to normalise the Notice of Race, the common-sense approach to the remaining issues in this America's Cup is prevailing," added Ehman. Etihad Stadium motoring towards Eden after being dismasted. Image copyright Etihad Stadium/Wild Thing Yachting. Tuesday morning representatives from seven of the eight maxis lining up for this year’s Rolex Sydney Hobart became mini boat skippers, racing two feet long model boats in the inaugural Little Boat Challenge. 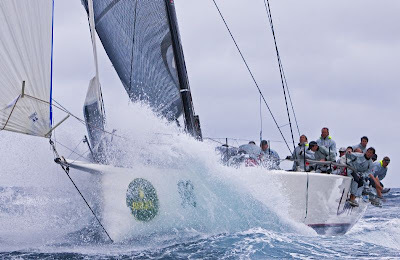 The event, held in the Cruising Yacht Club of Australia marina, was a preview to tomorrow’s SOLAS Big Boat Challenge and the highly anticipated Rolex Sydney Hobart line honours contest which will play out for real in a week and a half. Neville Crichton’s Alfa Romeo, represented by Kiwi helmsman Erle Williams, won the best of three series with two wins while Wild Oats XI’s skipper Mark Richards picked up one victory. Etihad Stadium dismasted. Image copyright Etihad Stadium/Wild Thing Yachting. 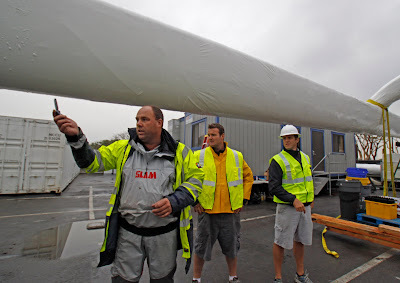 Following the model boat race the seven skippers and boat reps faced the press with the first question directed at Neville Crichton, whose spare mast may end up being cut in half and transported from Europe to Sydney as the replacement mast for Grant Wharington’s Etihad Stadium (Wild Thing). Crichton acknowledged that Wharington is a fighter but admitted his gut feeling is that Wharington is going to need “a hell of a lot of luck”. Mark Richards gave Wild Oats XI a 30% chance of repeating their remarkable success over the past four races adding, “It’s an honour to be racing against these guys”. He said he really enjoyed today’s model boat races because he had the opportunity to “elbow the other guys out of the way”, unlike the approaching ocean classic when it will be take no prisoners - each skipper hands at the wheel of their 90 to 100 footers as they power down the coast following the 1pm start on Boxing Day, 26 December. Ludde Ingvall’s 90 footer Tokolosh was renamed today, the boat now called YuuZoo. X40: It Doesn't Rain ....... It Pours!